With great pleasure I welcome you to the Trilingual Children, my third Baby, that is growing together with my two little monkeys that I'm raising trilingual - Russian, English and Italian. I've lived in four different countries, traveled around the world and visited many beautiful places. I speak Russian, English, Italian and German. 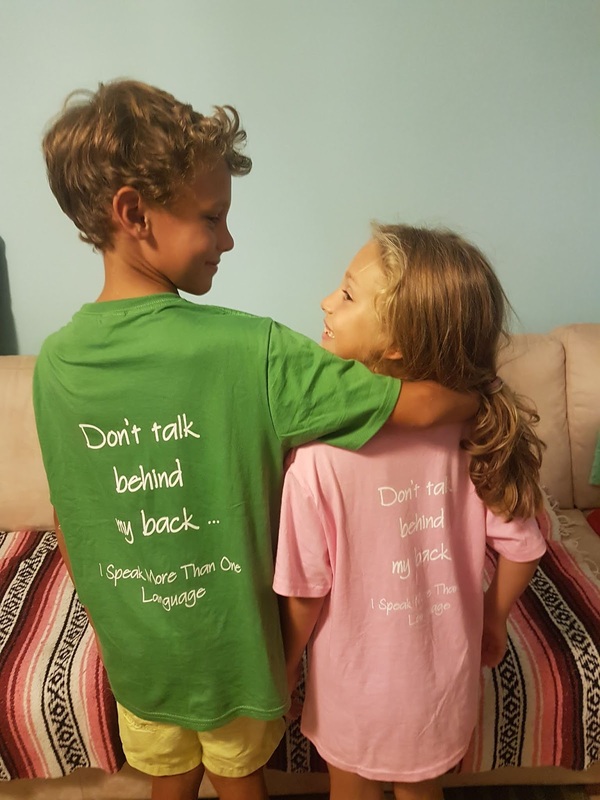 I have a job as many other parents that are raising multilingual children have and try to do my best in supporting other parents through this website. I also write children's books. Here, on this site, you will find reflections of my personal experience in raising my children speaking three different language, advice on how to do it, results of related scientific research as well as different language resources (Russian , Polish, English, Kids radio from around the world ...) and other parents valuable contributions. I think that the information here could be equally useful for any parents raising monolingual, bilingual, trilingual or multilingual kids. Feel free to contact me with questions, ideas, proposals ... and if you would like to join me (We could do more together! :) ). I do not want this website to be a story of one family. Let's all share our experience to ease the first years of multilingual parenting for those who is about to start. You could write about your bilingual / multilingual experience as a child or as a parent in the Life Story Series that opened with Amalia's post or contact me for an Interview or write an article and share your tips on bring up bilingual or multilingual kids. Guest posts are always welcomed! Ask me, if you'd like to be a regular contributor and blog together with me. The aim of this website and the series is to inspire and support parents in their multilingual journey. Big thanks to the contributors: Amalia, Daria Marmaluk-Hajioannou, Nathalie, Alicja Pyszka-Franceschini , Emilia Pallado, Andrey Kneller, Marina Kaffe, Maria Patsatzi, Marianna Du Bosq, Danuta Rosevear , Karolina, Semiha Sözeri ! And Yes!, expecting parents, you can do it! Your children can speak many languages and benefit from it, all thanks to you! Great way to support us is by sharing the articles you like with your friends. You can find Amazon affiliate links and some Google ads here and there on the website. If you click on them and/or follow the path to purchase something on Amazon, I receive a small percentage back from them. It is not a lot, but it helps me support the website. I have a one year old child. My mother tongue is Farsi and my husband native language is Arabic. The community language is English. We each talk our native language at home with him. We also send him to day-care daily where they talk English with him. I'm worried on how my child will distinguish between these three languages and when is he gonna start to talk? His pediatrician said he may have some delay talking and at some point we may need to drop the 3rd language so he doesn't get confused. I would appreciate if you can give me some tips on how to help him to talk faster? Since we are concurrently talking 3 languages with him, will he be able to distinguish? Great, we have exact same combination: Russian, English and Italian, living in US..
Hi Svetlana! What a coincidence! How old is your little trilingual ? Keep trying even if it seems hard sometimes. I am raising my children in French, Spanish and English. I only speak French to them, dad speaks Spanish and they get the English from daycare. My son is 3 and he speaks so well in French and in Spanish. English being the minority language until they start school. None of my children were being in their speaking skills. At the 18 months check, they both could say more than 20 words each in different languages. This is more than the monolingual children from my mother's group. Some of the Australian kids could not even say that many words. It does not matter, it just means they are focusing on a different skill. What i find difficult, since my children spend most of their time with me as I work from home is that their Spanish will not be as good as their French. So i put an extra emphasis on that language and remind dad that he needs to describe more and make more complex sentences so the kids can increase their vocabulary. My children never got confused. They understand the 3 languages perfectly. They first picked the easiest language, then as they became more proficient they use the words in the 3 languages. For example, with my children first said 'ta' for thank you, then they said 'merci' and 'gracias' and now 'thank you'. They also know what language to use depending who they talking to. Do not worry and keep up with the good efforts! !